 【High Efficiency】Production speed: 20/min.9600m per shift one day (8 hours) .  【Long Life Machine】Rollers of machine are CNC machine tooled, plated with 0.05mm hard chrome on surface.Heat treatment for cutting frame to remove the steel stress, to avoid deformation. Cutting material is Cr12 mould steel with quenched treatment, all these processing steps ensure machine long life time.  【High Precision】Shafts for rollers are tooled by grinding machine at least twice. Rollers are CNC processed to ensure precision performance.  【Automatic & Easy Operate】Safe and easy to operate with Mitsubishi PLC touch screen operating system.Friendly man-machine interaction.  【Excellent Services】Technician can be sent to your factory to install the machine and train your workers. Engineers are able to service overseas.We supply lifetime services for our machines.  “All-in-house source” – from raw material to the final high-precision forming machine.All are done in our factory.  Quality and delivery time can be controlled here.  With technical support by our 15years experienced engineers and technicians, we can provide you suggestion and solution within 24 hours.  We guarantee lifetime services for our machines.  Simple to install and easy to maintain. Our machines are well installed and tested before delivery. You only need to connect some tubes and wires in your factory. Video and manual will show you how to do.Our experience technicians can go to your factory and train your workers. High Speed Deck Roll Forming Machine to Mexico On December 03,2018 This deck roll forming machine is designed with Mitsubishi PLC controller, automatic cutting formed deck from machine as per user set required different length. High efficiency; Production speed: 20m/min. 9600m per shift one day(8 hours) . 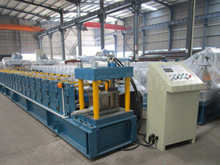 Long machine life: machine net weight is more than 17T. Strong machine to ensure 15 years running in buyer factory.